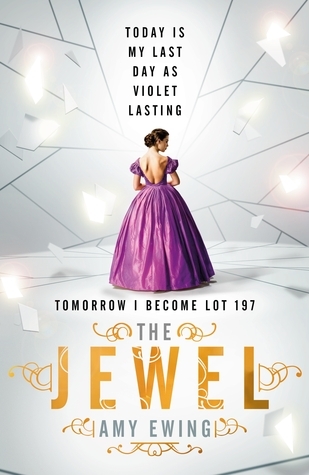 Synopsis: “Today is my last day as Violet Lasting. Tomorrow I become Lot 197. I’ve never read The Selection, so The Jewel is my first forage into a society that sits on the brink of fantasy and dystopian. I wouldn’t really classify this book as dystopian though, because the reader is not given a fully developed back-story as to how this place came to be. The world was built by four founding houses and consists of five rings. The outer ring called the Marsh, the fourth called the Farm, the third called the Smoke, the second called the Bank and at the very centre, the opulent Jewel where all the royalty resides. Violet Lasting is special. Tested at a young age, she and many other girls from the Marsh are removed from their families and held at a holding centre where they are trained. They all seem to possess these special powers called ‘auguries’ that can change the colour, shape and even growth of an object. But it’s not without its consequences. Because of their special gifts, these girls are auctioned off and become property of the royalty, who for some reason are infertile, and loses any semblance of their previous lives. Even their names. I must say I did enjoy this book. It was a quick read that both entertained and captured my attention. I liked Violet as a protagonist and found her personality quite compelling. While she’s resigned to a future as a surrogate, she manages to stay positive by finding little things that she can rebel against. Although some of it is not without its consequences. Violet as a character was likable, and I really appreciated how much love she had for her best-friend Raven, another surrogate she met at the holding centre. Unfortunately, she did become quite insufferable towards the end when the love interest suddenly appears. After meeting him twice, she suddenly finds herself infatuated with the guy (who I couldn’t even be bothered the remember the name of). And her jealousy made her even worse. The romance was definitely insta-love but I don’t hate it because of that reason. I can honestly understand why Violet and the guy was drawn to each other. She, because she’s only ever been surrounded by girls for most of her teenage years (hormones must be off the chart), and he because he’s seeking comfort and love in someone that’s not from the Jewel. But I still didn’t like it because it was a plot ploy that set up the storyline for the next book in the series. The Jewel introduces the reader to a variety of characters, each with their own unique personality. The one thing I liked the most about the book is that there’s a thin line between good and evil. Violet is sold to the Lady of the Lake, who is strict but rewards good behaviour. She’s deadly, but strong-willed. And she also has a soft side. It’s hard to hate her because she does treat Violet properly, and only strikes out at her when Violet rebels and misbehaves. Of course, the fact that she can even buy a person is awful, but that is how her society works. At least she doesn’t starve her surrogate or experiment on them unlike other royal families. Backstory. The world is situated on an island and was built by four founding families … where did they get the money and resources to do that. And why would other inhabitants agree to live in the outer rings? If they resided on an island, does that mean there are possibly other worlds across the water? Why are the royalty infertile? Cross-breeding? There was one point where it was mentioned that the new Electress who was born outside the Jewel had to be made infertile as part of the rules of marrying into royalty. So do they make themselves infertile as a status symbol? Where did the auguries come from? Overall, I enjoyed The Jewel quite a lot. It was entertaining and kept my attention easily. If you’re a fan of stories filled with intrigue and fancy ball gowns, then give this book a go! Thank you to Walker Books Australia for providing a copy in exchange for an honest review.